For Watsontown Brick, nestled in the foothills of the Appalachian Mountains in Watsontown, Pennsylvania, the decision to build a new plant was not made lightly. Owner Mike Fisher wanted to both increase production and meet the changing needs of architects and builders. Doing that meant building a new, bigger plant and purchasing additional kiln cars and equipment. Additional equipment included a Grand-Slam™ Impactor for use as a shale crusher, with capacities from 110-125 TPH. The Grand-Slam TM Horizontal Shaft Impactor helped reduce operating costs and increase production. Photo, Watsontown Brick uses a Stedman Grand-SlamTM Model 4260 Impactor. Fisher's family has been in the brick industry for decades. His grandfather became involved with Watsontown Brick in the 1930s. His father bought the plant during the 40s and Fisher took over the day-to-day operation of the plant in 1983. Founded in 1908 by a group of investors, the company originally manufactured primarily 4"x4"x10" paving brick, which were used on neighboring city streets. Today, 75 percent of the company's production is cored face brick used in building. Pavers make up the remaining 25 percent. Watsontown's market area has also changed. In addition to the local area, the company now markets its brick throughout the northeastern United States, with approximately 50 percent of the company's product going to New York City and Boston. They also service distributors in Nebraska, Ohio, Illinois, Indiana, Michigan, Maryland, Virginia, Delaware, New York, Connecticut and Massachusetts. To meet the changing market needs and his production goals, Fisher determined that automation was the answer. Fisher said, "The brick industry lends itself to automation. Producing brick is a time consuming process. Finding people to work in the plant can be difficult. Automation streamlines the process and allows us to increase production. PIn addition, Fisher wanted to be able to diversify and create different types and sizes of brick. Planned changes, such as a higher temperature kiln with a capacity of 2100°F to 2200°F, would give the company the capability to branch out and produce different types and color of brick. "Architects like to be creative," he said, "We wanted to be able to meet the demand." Until this time, Watsontown Brick had been producing only red brick. During the planning stages, one of Fisher's concerns was finding an impactor that could handle the increased capacity. Fisher said, "When we built the new plant we felt we wanted to get another Stedman Grand-SlamTM Impactor, one with a higher capacity for bigger volume. We were pounding the lower capacity machine. We knew we needed a bigger one. We lived with it in the older plant, but we didn't want to in the new one." To meet the requirements of the new plant, Fisher selected a Stedman Grand-SlamTM 4260 with a capacity range of 110-125 TPH and an inlet opening of 21" high x 61" wide. Installed in the fall of 2000, the Stedman runs non-stop at the Watsontown plant. Photo, One operator on a raised platform can oversee several operations. The shale comes from two deposits located just behind the plant. From one deposit the company mines regular shale. The other deposit holds a plastic yellow shale. As the deposits are worked, the company must rip and blast deeper in the pit where the shale is harder. An Eagle primary crusher processes the material as it comes from the mine, reducing the shale to 4 inches. A front-end loader piles the material in huge storage sheds. A feed material loader then feeds the material into two hopper boxes at the rate of 100 TPH. 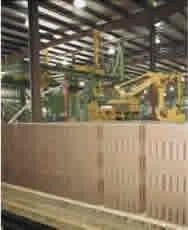 From there, a vibrating scalping screen with 5/8" opening on top and a 10 mesh on the bottom deck moves the material to storage or to the grinding room. The 10 mesh material goes in to 90 ton capacity steel storage tanks. The oversize material is fed to the Stedman impactor in the grinding room. The impactor reduces a shale and clay mixture. Moisture content of the shale is dry to 10 percent. Bulk density is 90 lbs. per cu. ft. Feed size is minus 1-1/2". Product size is -10 to -12 mesh. The material handled by the impactor is 80 percent shale, with 10 percent a combination of clay and shale and the rest clay. Watsontown uses its own supply of clay and imports, Ohio fire clay to add to the mixture. From the impactor, the shale runs through four finish screens. All product not sized to specification returns to the impactor. On the first pass, the Stedman reduces the shale/clay mixture so that 60 to 65 percent of the product will pass finish size. The rest returns to the impactor for another pass. Reduction can take up to 3 trips. In the plant, the impactor, clay working machine, the extruder, the kiln and all other production processes are monitored by a single person in an elevated control room in each area of the plant. This lets the operator keep an eye on the controls and watch over the processes below. The system is designed to automatically shut down if some portion of the system is not functioning properly. In addition, the new plant is equipped with full dust control, which means employees do not need respirators or masks. The noise level is also low, so that employees do not need earplugs. Scrubbers take care of sulfur emissions that may be given off during the firing process. 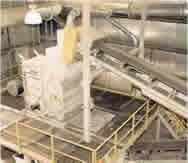 The plant also recycles any damaged brick by running it back through the production process. Any slab that is cut off during the extrusion process is scooped up and put back into the pile to dry and be reground. Photo, Robots stack green brick on kiln cars. The plant operates 365 days a year, 24 hours a day. Enough brick are extruded in five days to keep the kiln running day and night, seven days a week. The cars are programmed to move automatically through the holding and firing process so there is no need for human monitoring. The company has two storage areas, one for the unfired brick and one for the fired brick. To keep pace with the demand, production runs one shift daily. Unloading and packaging runs two shifts. Watsontown Brick now produces about 75 million brick a year, an increase of 40 million over the old plant and the Stedman impactor has met Fisher's expectations and helped reduce his operating cost.